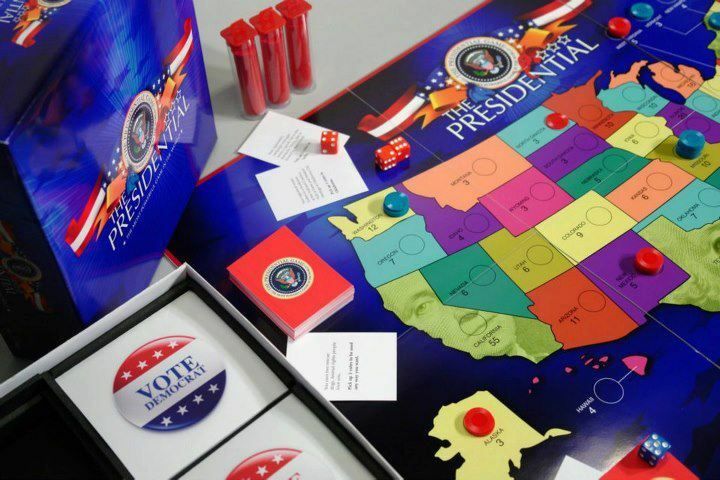 The theme of The Presidential Game is to get as many electoral votes as you can via campaigning and fundraising in a given amount of turns (weeks). You learn about how many electoral votes each state contributes, and how to strategize to get those big hitter states like Florida, New York, Texas and California. There are variety of strategies to try out to see if your team can get to the end of 30 plays ahead of your opponent! Now if you have a very political family, leaning heavily toward Democrat or Republican, your first challenge will be figuring out the teams and assigning someone to be 'the other' team. Though we do have a preference typically, it didn't really matter to the kids which one they were. There are no presidents assigned, nor mention of certain names in the game, making it a game you can play for years and years. This would be a fantastic game to break out the final night of a presidential election and play as you see them sharing who one which states on the news. The game is for ages 11 and up, with 2 or more players. This is a team game, much like the team needed to campaign in a true election. The team has to work together to make decisions as to what states to go after, and how much stake (chips) to put into each state. Will it be one the opponent will take over or is it safe with just a small presence there? Because you have teams you really can involve the whole family, even children under 11. They won't really understand the pretense of campaigning, but they are super tuned into rolling those 3 dice! We even up the team in ages, some young and some old folks (parents). If you do all thirty weeks (turns) this game will run at least an hour. Your dice rolling part of the team probably has ditched you by now and gone on to play with more exciting things, but hey at least they were part of the team for awhile. I am sure there are campaign folks who quit midway right, just like real life. Our first round we struggled with the math component of the game. There is a lot of adding and subtracting each round and the kids put that on dear ole Mom. Later we released there is this really great interactive map online that comes with the game that allows you to select and deselect the states you took each round, and it adds up the votes for you!! Woo hoo! Definitely one of the best parts of the game. I know the game really is a numbers game, but dear ole Mom didn't want to rattle her brain too much. We really enjoyed this game, and I for one loved the strategy component. There are many different ways you can try to attack the country for votes, just like if you were actually campaigning for the Presidency. 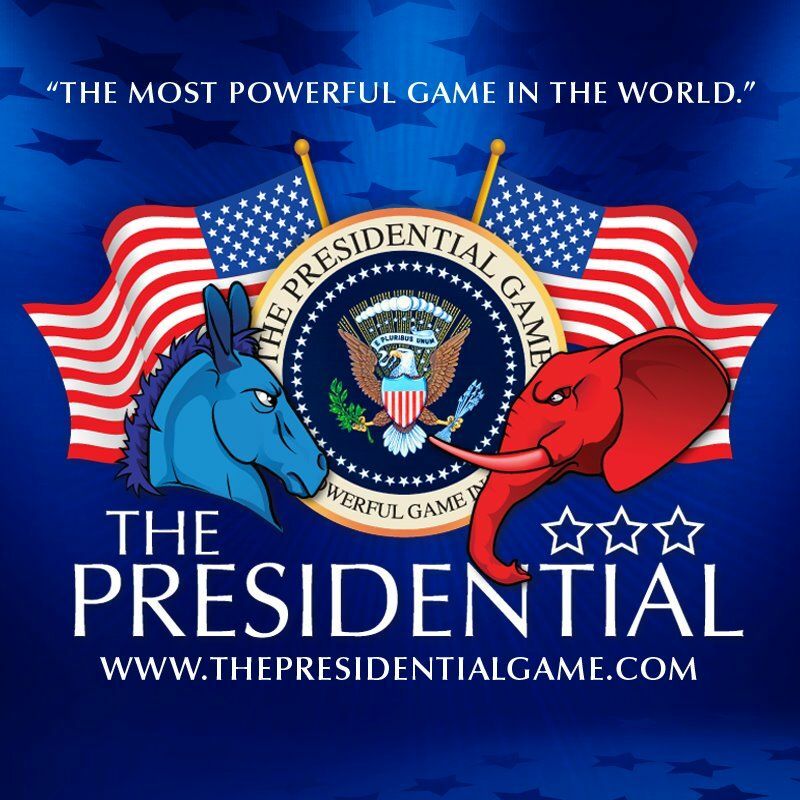 Order The Presidential Game for $35.